I’d half-heartedly set the theme of “moving house, or home, or furniture, or newness” at the end of our last meeting, as round 40 was to be the first DRC at my new house, but without really thinking about what this might mean. I’ve already played the Fever Ray album, which could be a contender, didn’t want to pick (half of) Aerial by Kate Bush, and couldn’t think of any snappily-house-related-titled bands or albums. So I ignored the theme, pretty much, and plumped for something I’ve been thinking about playing for a while. I explained it as being a completely new type of music for DRC to listen to at a completely new venue, but no one was biting. I know next to nothing about classical music, and even less about modern classical music, despite the best efforts of our old neighbour (from before we moved). 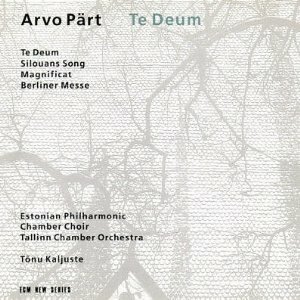 I recall being recommended, or intrigued by something written about, Te Deum by Estonian composer Arvo Pärt some years ago, and buying a copy as a result. I have, I believe, only listened to it once: classical is not my go-to music, and Pärt’s Te Deum is an intense, involved, enveloping listen; it’s not something you can just throw on the do the dishes to. I’ve been intrigued since we started DRC to see how we respond to something classical and unfamiliar, that we have little or no frame of reference for. Some context, drawn shameless from the Wikipedia page because I know not what I talk about: Pärt is just one of many composers to set the verses of Te Deum, which dates from AD 387, to music. He composed his version in the 80s, and the recording I have, on the ECM label, is from 1993. It is scored for three choirs (women’s choir, men’s choir, and mixed choir), prepared piano, divisi strings, and wind harp. To my ears, it’s a predominantly choral piece which slowly swells from literally nothing into huge, almost overwhelming rolls of voices, strings, and surreptitious drones. I don’t understand it, but it does move me. Pärt has said that the original text Te Deum contains “immutable truths,” reminding him of the “immeasurable serenity imparted by a mountain panorama”, and that it seeks to communicate a mood “that could be infinite in time—out of the flow of infinity. I had to draw this music gently out of silence and emptiness.” That pretty much sums it up. As a counterpart, and because Te Deum lasts for only 29 minutes, I played Avatar by Swans from their current album The Seer, which has a similarly intense, devout atmosphere, but creates this ethos in a very different way, with strikingly different tools, and heading in a very different direction. Tom Listened: Although Nick is spot on when he said in his response to Rob’s offering from this meeting (Home by Casper Brötzmann Massaker) that Te Deum complemented it well, for some reason it did not elicit the same reaction from me despite sharing many atmospheric (if not sonic) similarities. I was already vaguely familiar with the work of Arvo Part as my parents own a few of his CDs and I have always found them pleasantly interesting whilst also being somewhat perplexed by them. There are, for me, many paradoxes contained in his music…it’s modern yet sounds like it’s hundreds of years old, it drifts by without making much of a fuss yet it demands attention, it’s not unsettling yet it isn’t without its unsettling moments, it’s VERY quiet and then VERY loud…music for cars it most definitely is not! Unsurprisingly, I’m not really sure what I thought of it but I certainly wouldn’t be against another listen. Rob listened: We have an Arvo Pärt record which i’m reasonably familiar with. My Mother-in-Law bought it for us. It’s the only record we both like, as far as I know, although I do recall her commenting favourably on hearing portions of Low’s ‘A Lifetime of Temporary Relief’. Our album is called, pretty definitively, ‘The Best of Arvo Pärt’ and this piece is not on it, therefore it must be one of his shitter numbers. I really enjoyed it though. What a glib sentence to write about music written with the single intention of stirring the soul and offering humble praise to a divine being. I did enjoy it though, really. Swans have been one of my favourite bands since I reviewed ‘The Great Annihilator’ in 1995 and ‘The Seer’ does genuinely seem to be, as Michael Gira has claimed, “the culmination of every previous Swans album as well as any other music I’ve ever made, been involved in or imagined.” Coincidentally, as we met for DRC on a Wednesday evening, my ears were still ringing, not yet fully recovered from seeing this very band play in Manchester four days earlier in a pulverising, devastating, transcendental performance which, as it happened, achieved for me the pure holy intensity that Mrs Pärt’s lad was aiming for with ‘Te Deum’.